In Gateshead, arts organisations such as the Baltic centre for contemporary art and the Sage are protected from deep local authority cuts – unlike in Newcastle. A host of artists connected to north-east England – including musicians Sting, Neil Tennant, Bryan Ferry, Mark Knopfler and Thomas Allen, writers such as Pat Barker and Tony Harrison, and actors including Robson Green and Kevin Whately – have written to the Guardian expressing "alarm" at what they call Newcastle city council's "shortsighted attack" on the city's cultural life. The artists are protesting against the local authority's plan to cut completely its £2.5m culture budget. The council, argue the artists, risk "throwing away a shared cultural heritage … built up by generations and generations of ordinary people in the city." Its decision, they say, is "baffling". Arguing that the cuts would be "economically disastrous", they write: "The council's support helps these arts organisations attract many millions of pounds in yearly investment to the city." The "blanket and pre-emptory" cuts could result in "generations of young people denied access to the opportunities we were given and, without the council's support, the arts will simply become a pursuit for the most wealthy", they add. Organisations affected by the proposed cut include the Northern Stage and Live Theatre, as well as the Laing Art Gallery and Great North Museum. The Theatre Royal would be particularly hard hit if the cuts were made, losing around £600,000 per year. 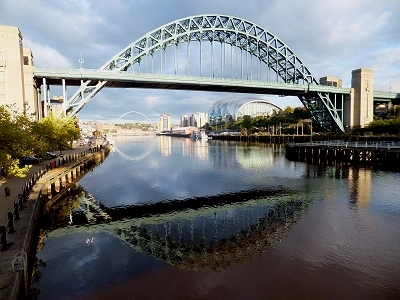 The proposal is part of a planned budget to cut £90m from Newcastle's public services by 2016, after the city's central government grant was reduced by £39.3m. The proposal is now out for public consultation, and due to be ratified in March. Across the Tyne in Gateshead, arts organisations the Baltic centre for contemporary art and the Sage, created as part of the town's ambitious cultural regeneration programme, remain protected from deep local authority cuts. The spectre of squeezed councils cutting cultural budgets is now regarded as posing a serious danger to the arts in England — one recently highlighted by Danny Boyle, director of the 2012 Olympics opening ceremony, who has recently written to David Cameron and George Osborne urging a "national-led" solution to the problem. Labour-led Newcastle is not the first council to have proposed completely removing support for the arts. Last year, Conservative-led Somerset carried through a 100% arts cut, leaving local cultural organisations reeling. It is feared that over the coming months others will follow suit, arguing that functions such as welfare and children's services need to take precedence over theatres and galleries. Such cuts are in the context of the 30% reduction in Arts Council England's budget made at the last comprehensive spending review, plus the extra £11.6m cut between 2013 and 2015 announced last week. Arts Council England is understood to have made it clear to local councils that it is not able to shore up organisations that would founder without local authority funding. The council has been consulting on the proposed cuts under the heading Fair Choices for Tough Times. It says it must cut £90m over three years, equivalent to £760 for every household in the city, on top of a £100m saving over the last two years, and admits that will cost 1,300 jobs, close 10 libraries, and cut "services that people have come to rely on". A spokesman for Newcastle city council said: "Newcastle is one of the very few councils that is setting out three years of its budget rather than year by year and is therefore being much more transparent about the implications of the government's austerity measures. "We face unpalatable decisions which we know are counterproductive and, in many cases, a false economy but the council can only spend the resources that it has as it faces losing more than a third of its budget over the next three years, forcing difficult choices about its priorities. "The reason for a long-term approach is to be able to talk with cultural organisations to find alternative sources of funding, and we are having positive discussions with organisations across the city about what we need to do together. "The Arts Council, which is a much more significant funder of the arts than the city council, has also announced multimillion pound cuts to the arts and we therefore need to apply our efforts together in lobbying government for greater funding for Newcastle. "Although the total amount the city council contributes to the arts sector is significant it is much smaller to individual bodies – between 2.5% and 15% of the amount that they receive – and we would therefore not expect that our reductions alone would result in the closure of an arts organisation."